Through Bunraku, an archly-stylized swordplay fantasy, 33-year-old actor Josh Hartnett returns to the genre spotlight playing an enigmatic drifter appropriately called, "The Drifter." This computer-enhanced tale revolves around Hartnett's character, a "Man with No Name" and draws heavily on Samurai and Western tropes in an alternate-world dystopia where guns are banned and the sword is king (as it was in Japan until the end of the 19th century). The film's title is based on bunraku, the 400-year-old form of Japanese puppet theater; the puppets are four feet tall with highly detailed heads, operated by several puppeteers who wear black robes and hoods so as to not distract the audience. In Guy Moshe's uncharacteristic follow-up to Holly (his controversial film on child trafficking shot in Cambodia's brothels), a classic retribution-and-redemption tale is re-imagined in a skewed reality blended with arch characters and shadowy fantasy. A crime boss who rules with an iron fist and nine assassins -- Nicola the Woodcutter (Ron Perlman) -- is the most powerful man east of the Atlantic. His associates include the murderous, cold-hearted-yet-smooth-talking right hand man, Killer #2 (Kevin McKidd), and lover Alexandra (Demi Moore), a femme fatale with a secret past. The citizens live in fear and hope for a hero who can take them out. In come the drifter to the Headless Horseman Saloon who tells the bartender (Woody Harrelson). that he wants two things -- a shot of whiskey and to kill Nicola. Then enters a samurai, Yoshi (Gackt Camu), who wants to avenge his father by recovering a talisman stolen from his clan by Nicola. Guided by the bartender's wisdom, the two eventually join forces to bring down his corrupt reign, chopping heads and limbs along the way. The California-born Hartnett had developed a steady career appearing in such Hollywood films as The Faculty, Black Hawk Down, Lucky Number Slevin and Pearl Harbor. In 2002, he starred in an adaptation of William Shakespeare's Othello, O, set in an American high school, as Hugo -- the film's version of Iago. He then starred in Brian DePalma's true-crime mystery, The Black Dahlia (based on James Ellroy's book), as a detective investigating the real-life murder of actress Elizabeth Short. Next he tackled two other genres -- the classic boxing drama, Resurrecting the Champ, with Samuel L. Jackson, and the graphic novel-based horror thriller, 30 Days of Night, in which he played a small-town sheriff battling vampires. Hartnett's turn-downs have been as notable as some of the films he made; he passed on an opportunity to play Clark Kent/Superman in the film that was going to be directed by Brett Ratner and was going to play trumpeter Chet Baker in The Prince of Cool, but didn't agree with the producer's ideas. 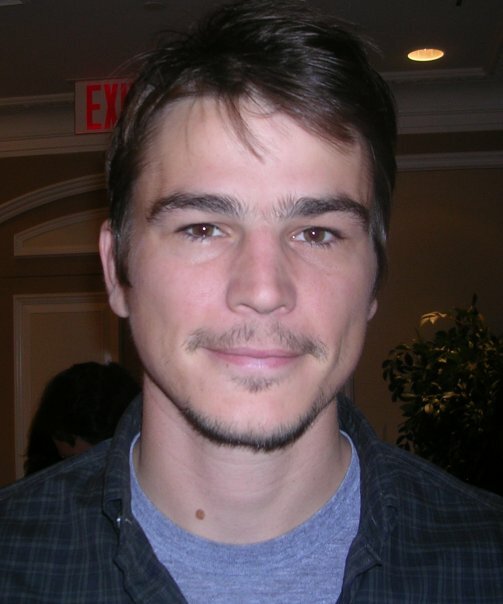 In 2007, he took time out from filming to support the green lifestyle campaign of Global Cool. But more recently Bunraku premiered as a selection of 2010 Toronto International Film Festival Midnight Madness section. A theatrical and VOD release is slated for this weekend. As Hartnett regains a public presence -- he has a quartet of films up-coming including Singularity and Stuck Between Stations -- he is again giving interviews such as this exclusive Q&A. Q: You had a string of exciting, interesting films and then slowed down a bit. What went on between those films and this one? JH: I've been working, just not necessarily acting. I took some time off from acting. I started a production company, directing a little bit and writing a lot. Right before this, I did a movie, I Come with the Rain, which didn't really get a release because it was so dark. And then I did this, and now I've got a movie called Singularity with [director] Roland Joffé that will come out soon, I believe. Q: It's supposed to be science-fiction? JH: Well, it's set in the late 1700s in India. Q: I thought it had a time travel theme to it. JH: It's set in 2020 as well. There's no time travel, but it's about the possibility of reincarnation. Q: When you do offbeat and off-kilter dark things, something like Bunraku, it forces you to figure out how to give life to an unusual character like in this film. What was it that you did to make him into a character, into an archetype of some kind? JH: A film like this requires making up an entire backstory because there is no backstory to speak of. You don't know anything about him. I came up with a world that he might have existed in and then gave him some pathos. Q: Enlighten me about that world that lies behind him which we don't necessarily see outlined in the film? JH: Obviously, his father was killed, so he didn't really know his father. His mother was gone, so he was raised by somebody else. I thought it would be interesting because the world was kind of a circus-oriented film. If he was part of something like that, he was a drifter of some sort. He's called "the drifter." So who drifts? We came up with traveling gypsies, and that was the way that he was raised. He didn't know any home, really, and he didn't really know who he was and he was never given a name. We spent some time figuring out who he was and decided that it almost doesn't matter what his backstory is. What's more interesting is why he's here and why it's taken him so long to get back. My idea is that he wasn't really told about this situation, like about his father being killed, until he was old enough and he'd been living in this gypsy world for a long time. And then he had to spend some time figuring out how he was going to take revenge. No guns, so he had to learn to fight. He's just a brawler, a natural brawler. Q: How much did this bring out your inner brawler? Did it take a lot of work for you to put aside your pacifist elements and get the brawler out of you? JH: There were some pretty physical things in this film to do, so I had to work pretty hard to get my body in shape for this. But I've got a little brawler in me. Q: Were there any famous brawls in your past that you engaged in or defused that you can tell me about? JH: I haven't been in a physical fight since I was 14. I broke up a fight in New York a few years ago, and then the people who were in it tried to sue me saying I was in the fight. That's just some bad behavior on some idiot's part. But no, no, I don't. Q: Obviously there's the Japanese cultural background to this film. Did you read books about the puppet theater or look at samurai films? Do you know about the wandering samurai, the ronin; did you look into any of that stuff? JH: There were a lot of different references for this film, one of them being something like a ronin, but having to do with [the late director Akira] Kurosawa usually -- and it was film references, mostly. Kurosawa was used in creating this, there was [Sergio Leone] of course, and then Jean-Pierre Melville -- French New Wave stuff. This is such a film-centric film, I had to do a lot of watching of films to kind of figure out what [the] references [were]. Q: Name three films that you saw that will stay with you for the rest of your life now that you've viewed them in doing this movie. JH: I've watched a lot of French New Wave films, but they were mostly the Truffauts and the Louis Malles, those kind of guys. And then pretty much Guy, the director, introduced me to Jean-Pierre Melville, and he's one of my favorite directors now. Q: Did you have any particular Kurosawa film or other samurai movies you watched to prep for this? JH: Hidden Fortress. I've seen everything of Kurosawa's over the years; I don't know what I watched specifically for this. This is three and a half years ago you know, that we started filming this. Q: When you were filming, did you know about the digital side of it? How much did that help or hurt you in making the film, knowing that it was going to be altered technologically? JH: It was no different for me. I saw the landscape drawings that were sitting in the production office and I knew what he was going for as far as the feel of the world. But we were on physical sets the whole time. So for me it was like making any other film, except there was a lot of physical requirements that I had never had to use before. It doesn't matter to me what the sky is going to look like. Q: How was it seeing the finished product? That must have been exciting to see things turned into other things than what you knew in the making of it. JH: Sure, Guy really pulled it off. The reason I was drawn to this film was because of Guy's vision. Before I even read the script, he came in and spoke to me in New York about being in it. He didn't want me to read the script, he wanted to explain it to me visually, he wanted to have a discussion about his reference points as far as other films go for the film. And then I went and read the film. I was intrigued by Guy's thorough understanding of what he was trying to create, even though most people wouldn't understand it just by reading the film or looking at the title, of course. But he pulled off what he was going for, and that's brave and takes a lot of guts and intelligence. Q: What did you think about the cast he selected for this movie? Were they people you had worked with, or wanted to work with? JH: I love the guys that worked on this film. We spent a lot of time hanging out. We were in Bucharest, Romania. There wasn't a lot else to do except hang out with each other, so we got to know each other very well. Obviously I've been a fan of a lot of their work for a long time, so it was unsurprising that they were great fun to work with on set. Q: Did you see his previous film Holly? What did you think of it? JH: I hadn't seen Holly when Guy came out to New York. He came out with a completely clean slate. I knew he was a new director, but he knew exactly what he was going for. He was very conscious of the fact that it was something new for him as well. He's an incredibly intelligent guy. I believed that he could make something unique, something interesting, something different from the cookie cutter films that come out every week. This is obviously not right down the middle, so I was really pleased with the final product. Q: Did Guy's Israeli background enhance your appreciation of each other and did it add to the dialogue between you two? JH: Guy comes from a world where there's a lot of fighting, obviously, and so the theme of the film made sense to me knowing that he was Israeli. But he's a remarkably easy guy to get along with. It doesn't matter where he's from. I trusted his judgment on this film. We had our share of talks about what I wanted to do with the character, and we came to a conclusion and I'm proud of the outcome. I always like to work with people who have a real sense of what they're going for. If you're working with someone who's just accommodating all the time, then you never know where you stand. Guy definitely has opinions and he definitely knows what he wants, and that's reassuring for me as an actor. So this was a good experience.